For an unplugged sound that’s rich, loud and electrifying, step on the V-TONE ACOUSTIC DRIVER DI ADI21. This amazing little box is essential for piezo-equipped guitars and will make your acoustic guitar sound come to life! By their very nature, piezo pickups tend to be very bright, with somewhat reduced bass response and warmth. The ADI21 combines the features of an active DI (direct injection) box with our proprietary microphone/tube emulation. If you don’t want to use the emulation feature, the ADI21 also functions as a superb active DI box. The BLEND control allows you to mix the amount of modeled tone with your instrument’s normal output. The resulting sound is more natural with smooth saturation, just as if your guitar were being miked. Armed with an onboard 3-band EQ, with sweepable mids to keep feedback under control, the ADI21 effectively eliminates the harsh harmonics of piezo pickups. 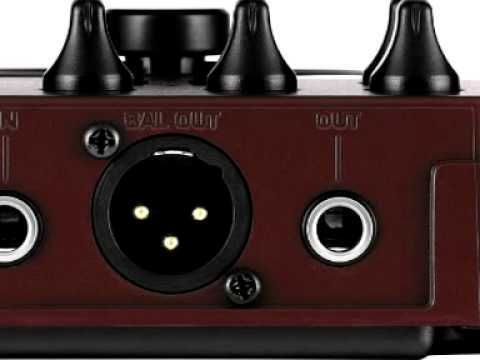 The output is laid out on 1/4” TS or balanced gold-plated XLR connectors, which can be used to send a low-impedance signal to the mixing console or straight to tape. You also get a ground lift switch to eliminate annoying ground loop hum problems. You can power this little lifesaver with a 9 V battery or our PSU-SB DC power supply (not included). Putting some acoustic glory into your recordings or live performances has never been this easy—or sounded this incredible. Try the V-TONE ACOUSTIC ADI21 at your local BEHRINGER dealer and find out just how affordable great acoustic sound can be.